The 1940 Summer Olympics, officially known as the Games of the XII Olympiad, were originally scheduled to be held from 21 September to 6 October 1940, in Tokyo, Japan. They were rescheduled for Helsinki, Finland, to be held from July 20 to August 4, 1940, but were ultimately cancelled due to the outbreak of World War II. When the Second Sino-Japanese War broke out on July 7, 1937, Kono Ichiro, a member of the Diet (legislature), immediately requested that the Olympics be forfeited. The 1938 Far Eastern Games were also cancelled, but Japan's IOC delegates persisted under a belief that the war would soon be over. 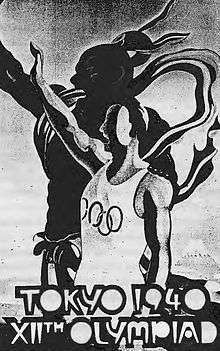 Amid the intensification of the war, the feasibility of both the Summer Olympics and the 1940 Winter Olympics grew increasingly questionable to other countries, who suggested a different site be chosen and spoke of the possibility of boycotting the Games were they to proceed in Japan. Meanwhile, Japan hosted the 1940 East Asian Games in Tokyo, with six participating nations. Helsinki eventually held the 1952 Summer Olympics, while Tokyo held the 1964 Summer Olympics and will hold the 2020 Summer Olympics. ↑ "Glider design to be used at the 1940 Olympic Games". Retrieved 2008-03-25.